We love food trucks whether it’s falafel wagons, hotdog carts or taco trucks. The most popular street foods are cheap, fast and filling. We want to make sure that they’re safe as well. Last week we talked about the importance of hand washing stations in restaurants, but if you have a food truck it can be challenging to have a hand washing station. For many mobile operators, installing a hand washing station isn’t necessarily simple, if it’s possible at all. Recently the Boston Glove put together an article about food trucks and the corresponding health violations. (Kotz, Deborah. “Food truck popularity outrunning hygiene,” The Boston Globe – Metro, August 4, 2013, Digital). Six out of the first seven food trucks mentioned in this article were cited for failure to provide water for employees to wash their hands. Lakeside Foodservice has a solution for these remote servers with mobile Hand Washing Station that can be set up almost anywhere. 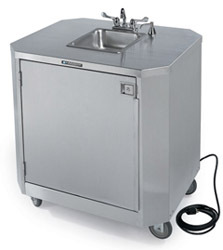 Lakeside’s Hand Washing-Station features a durable stainless steel sink and locking cabinet on wheels. The cabinet holds either five or ten gallons of fresh water, depending on model, with a 7 or 14-gallon wastewater tank. It also holds a liquid soap container, a water pump and a heating unit for warm water. Cold-water-only or warm-water-only units are available. The Station also features heavy-duty chrome plated brass faucets, paddle handles and a chrome plated soap dispenser mounted next to the sink. A bar for roll-type paper towels is mounted on the side, or you can order a folded paper towel dispenser. Five-inch non-skid casters with two locks make it easy to maneuver. There are many outdoor and remote food service applications where the Lakeside Hand-Washing Station will keep customers safe and satisfy the local health inspector. Both remote operator and street food connoisseur alike should applaud Lakeside for manufacturing products that keep us safe and keep our favorite dining traditions alive.